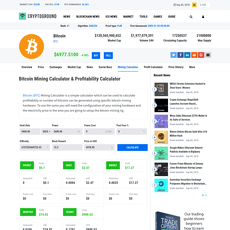 8+ Cryptocurrency and Bitcoin calculator for Mining, TAX, Profit and Fee - Cryptolinks - The World's Best Cryptocurrency Sites List! 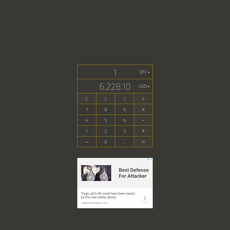 Have you ever wondered what it would be like if you never had a crypto calculator to do some calculations for you? You would probably get a lot of things wrong and end up making a wrong transaction with a wrong amount. Anything that has to do with calculations and conversions, a calculator has to be involved; even if you know the result, a calculator is very important. Therefore, the importance of a crypto calculator cannot be overemphasized because it is built on a different algorithm that could be quite difficult to comprehend. Almost all crypto site need a calculator either to do some exchanges or act as a data tool i.e. currency converter. They are virtual in operation and can be used to convert fiat to digital currency or digital to fiat currency or even digital to digital currency. 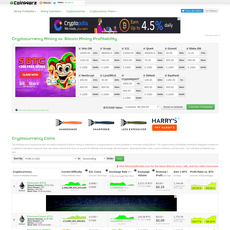 However, there are 9 sites in this category on Cryptolinks that will make several activities like mining, exchange and investing easy for you with the aid of their calculators. The sites that have been reviewed include; WhatToMine, Preev, 99bitcoins, Coinwarz, Cryptogorund, MyCryptoBuddy, Moinero.how, and Bitkoin. Each one of them have diagnostic features that makes them different from one another but similar in services. One important thing almost everyone who mines or uses cryptocurrencies to do business does is to check for conversion rate. The conversion rate from one currency to another currency is important. The price of cryptocurrencies change by the second or minute and it is important to be updated in order to run at loss. 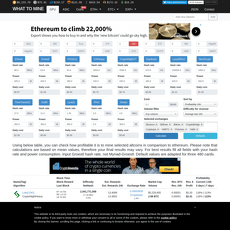 Firstly, these calculator sites must have the real value of cryptocurrencies i.e. 1 BTC per USD or any digital/fiat currency of your choice. The rate of conversion is important in order to make further conversions on the site; it is like a yardstick to get what you actually want. For instance, if you have a fiat amount of 1000 USD and would love to purchase something in BTC, you can use these calculators to convert from 1000 USD to BTC; meanwhile, there is an exchange rate to provide the amount you need. 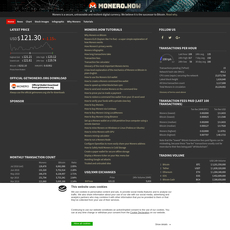 Secondly, these calculator site must be able to allow you monitor prices of cryptocurrencies. Cryptocurrencies fluctuate by the minute, the accuracy in the change from one rate to another is of immense value. Through this, you can easily figure out how many Bitcoin or Ether you can buy or sell in the exchange market. Another important thing is the price data, in fact, it is a factor that determines the conversion rate for your cryptocurrencies. A good crypto calculator doesn’t operate with a price data from only one market, it makes use of multiple markets in order to get a good conversion. The reason for the different number of markets is to compare, contrast and get an average price for cryptocurrencies. Different markets could have different values for their cryptocurrencies depending on some factors such as time; however, so a good conclusion could be drawn, an average for these prices will be what these calculators will use for conversion. Also, a weighted average price that will be gotten is shown by default as the 24hours’ trade volume. Most sites even allow you to choose alternatively a specific source for your price data on the settings menu. Inasmuch as they are calculators which are meant to be responsible for every crypto calculation, some of them are selective on the type of crypto they convert. No doubt, there are calculators that will convert all currencies from one form to another and there are some that are just limited to one. 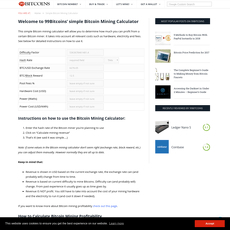 For instance, a calculator site like 99 bitcoins only does conversion for USD/BTC while WhatToMine does for almost all with regard to the data tool it possesses. All the sites in the category have been reviewed on these factors and some other features they possess. It will be recorded that inasmuch as we presented the top 9 available, some of them aren’t the best as they are meant to be. The reason being that they are poorly updated and the quality for conversion is low, but some other features they possess gives them an advantage over several others that were not listed. In conclusion, the work of a crypto calculator goes beyond giving you values, it allows you to make reasonable decisions at critical times. It tells you when to buy and sell your digital assets. A great calculator makes use of different tools coming together to form a data tool that is valuable for giving relevant information. 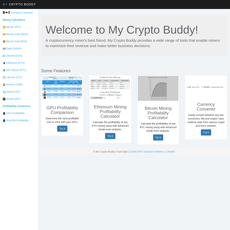 The best crypto calculator here is WhatToMine but you could have a different choice based on your wants.